Pappaya Smart TV takes interactive whiteboard technology to the next level by combining 10 IR point touch performance, LED back-lit, high definition screen, computer-free, real- time annotation technology and elegant design into a fully integrated, easy-to-use, play, smart all-in-one whiteboard. We strive hard to provide the best user experience incorporating gesture technology. 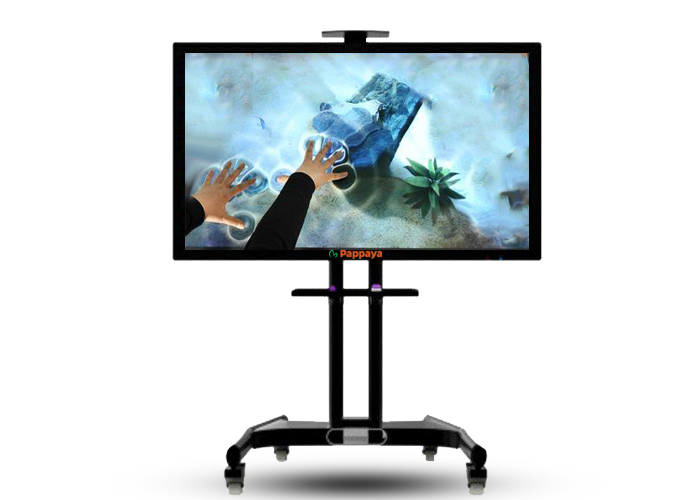 Recognizing up to 10 points of touch, Pappaya Smart TV Display system allows up to 10 fingers or pens to touch on the screen at the same time. Participants can take an active part in meetings, brainstorming sessions, meeting room interaction and more. 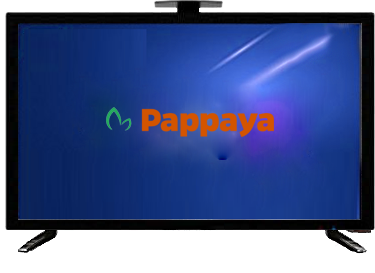 The Pappaya TV comes with a wealth of input/output terminals-on the front and the side of the touch screen to enable easy connection with a wide variety of external equipment’s. This arrangement of terminals includes HDMI Ports, VGA Port, S Video Port, AV Port, RF TV port, YPbPr Port and AV output. Users can speed up their writing speed by selecting proper tools from the pre-programmed pen buttons. The pen buttons can be customized with the users’ favourites. Users can also connect their own Windows PC or laptop or add an integrated PC directly into the Pappaya Smart TV, giving them an additional advantage with very less power consumption and a feather touch on/off switch. Pappaya Smart TV perceives the available light in the room and accordingly adjusts the picture quality and saves the power consumption. Innovative smart board technology gives you a wonderful smooth writing experience with highest level of precision. Using Pappaya Smart TV and our Pappaya ED application, users can drag contents from their cloud storage directly onto the working page on the smart TV. Users can use their own tablet or laptop devices (from Windows, iOS, and Android devices) to connect to the Pappaya Smart TV using screencast / mirroring feature. An Extensible Whiteboard which helps to intervene the contents of the main board to simplify or discuss the course materials. Users can create a slide show of pages they teach or learn. It can be perfectly used for creating a scrolling board or signage boards. Users can replay a page created by them from the beginning or from any point in between for the students’ benefits. We offer a variety of support and service plans to fit the users’ needs. Pappaya Smart TV renders superior after sales services related to Audio Visual systems and solutions that we deal with. We have dedicated service team with provision for In-house support, On-site support, Telephonic support, emergency service calls and email support. Pappaya Smart TV comes with movable wheel bracket and wall mountable bracket, which means the TV is always ready to be up and running in a matter of minutes. Our smart TV is designed to withstand heavy usage like the one in classrooms with scratch resistant and break resistant toughened glass. Pappaya Smart TV comes with an inbuilt audio system which serves as both Mic and speaker. Pappaya Smart TV connects to devices in the room very easily since it has multiple HDMI and USB ports and more. Pappaya Smart TV comes with 5 years non-transferable limited warranty to the original end user purchaser. 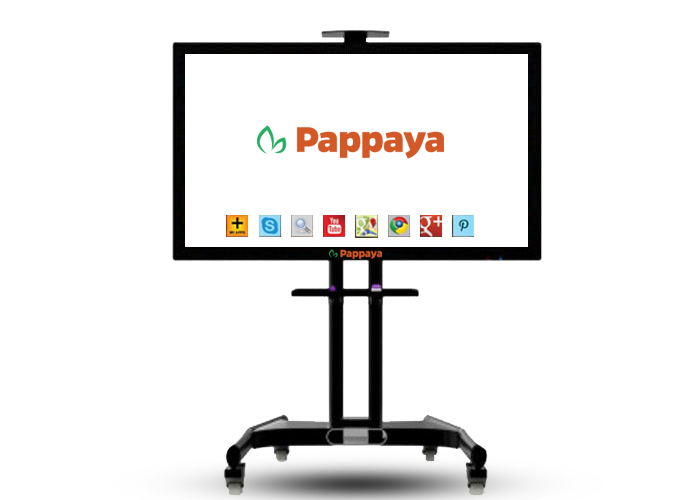 Pappaya Smart TV takes interactive whiteboard technology to the next level by combining 10 IR point touch performance. Users can watch and read the screen contents with clarity without reflection or glare. Users can connect to the web with the help of ethernet or Wifi. INFINITY PEN , AMBIENT LIGHT SENSOR 58" , 75" , 86"